A good portion of our lives is spent trying to make things work, be they a microwave oven, a coffee machine or, God help me, a television. Our first television was in 1962, with two channels, BBC and ITV. It was black and white with a resolution of 405 lines. (BBC2 introduced 625 lines in 1964). 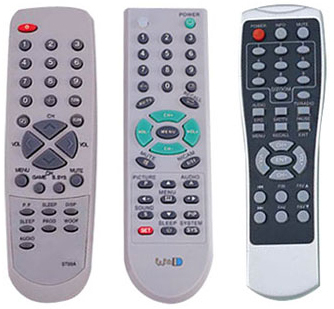 There were 4 controls: on/off/channel, volume, brightness and contrast. Here we are, 45 years later, with fundamentally the same primitive technology, and the most ghastly user interface and technology produced by man. The TV industry has been plagued by a plethora of so-called standards: the American NTSC, the British PAL, the French SECAM, and a host of variants, all mutually incompatible. The result is that viewers who want to watch programs from neighbouring countries have to buy much more expensive dual-standard televisions. Concomittantly, enormous sums have been spent trans-coding programs between standards, with consumers footing the bill. The video industry fares no better. No sooner were video casettes invented, manufacturers developed mutually-incompatible formats (VHS, BETAMAX, VIDEO 2000), again forcing consumers to buy dual-standard players. Learning nothing from past mistakes, the DVD industry also started a standards war (which was finally settled by Lou Gerstner). But true to form, they quickly created two dual-layer recoding standards, DV- and DV+, so that the public could be confused and once again milked. An identical standards war is now in progress for the next generation, between Sony/Panasonic’s Blu-ray Disc, Toshiba’s HD DVD and Maxell’s Holographic Versatile Disc. Compact Disks (CDs) were coined barley 20 years ago. The technology was well thought-out, cheap and perfectly standardised; the proof of good design is that it hasn’t had to change since its inception. The telephone (fixed, cordless and mobile GSM) is a further technology whose engineers have produced miracles. My mobile phone not only allows me to talk to anyone on the planet instantly, but also has a camera (still and video), remindes me of my appointments and displays my emails. The palm-sized package communicates over GSM, USB and Wifi (802.11b/g), has a display quality that rivals current television and costs less than half the price of a television receiver. 125 buttons just to watch a TV program? None of the 125 buttons point me intuitively to meet those needs. What the hell are all those random colours and unrecognisable icons for? Why must I have three different controls? (Yes, I know that some remotes can double for their buddies, but I’ve yet to meet someone who can manage the feat). I can’t remember that BBC1 is channel 491, why the hell can’t I have an alphanumeric keyboard? A PC keyboard has less buttons. The worst interface created by man. P.S. We have a television, but I never watch it.